Many are no doubt wondering what makes the Ridgeline so special. 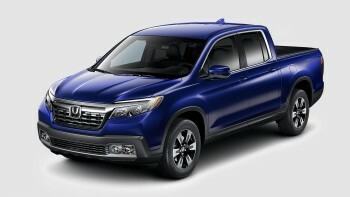 The automotive journalists who designated the Ridgeline as the North American Truck of the Year considered a wide variety of factors, including driver satisfaction, vehicle safety, and standard amenities. The Ridgeline’s unit-body construction allows its frame to rest low to the ground, and a standard dual-action tailgate maximizes the utility of its damage-resistant truck bed. In the Ridgeline, drivers will also be able to access an industry-first 540-watt truck bed audio system. The 2017 Honda Ridgeline has ushered in a new era in vehicle safety by offering Honda Sensing driver-assistance technology and LED headlights as optional upgrades. With these features equipped, the Ridgeline has earned a Top Safety Pick+ designation from the Insurance Institute for Highway Safety, a feat which no other pickup has ever matched. This is the second time that the Ridgeline has been honored as the North American Truck of the Year, and West Michigan drivers are inspired by the tradition of excellence that this pickup represents. The 2017 Honda Ridgeline was designed and manufactured by Honda’s employees in North America, and it’s the perfect truck for drivers in the USA. Visit a West Michigan Honda Dealer near you today to take the Ridgeline for a test drive!